12 Truly Epic Battles - Now YOU are in command! Players now maneuver their armies over a double sized map made by combining the two mounted maps found in Expansions 2 and 3, or purchased separately from GMT Games. 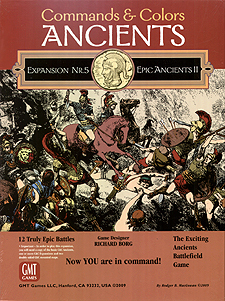 The Commands & Colors: Epic Ancients II game allows up to eight players to experience the competitive fun of a large sized ancients battle, but we know many have enjoyed Epic Ancients as a two-player game, even though the battles last longer than a single map Commands & Colors game. Try it both ways and see how you like it! IMPORTANT: In order to play this expansion, you will need a copy of the basic game, one or more C&CA Expansions and two double-sided C&CA mounted maps.